Once, a colleague of mine told me "If I only could see God with my eyes, I believe that the God exists. You see, seeing is believing". Because, I don’t see God, I don't believe that he exists - is the argument of so many people today.But, you don’t see so many things in life. I had never been to USA or so many other countries of this earth.So, can I deny that they don't exist.? And, what happens, if I deny their existence.? Nothing, whether I believe or not they still continue to exist. his partial Virat rupa - Universal form to Dhuryodhana, they only gave up their plans of trying to capture Krishna with chains, arresting him and putting him in the jail.Dhuryodhanas reaction was,"Krishna is a magician and had some magical powers. So, why cant people see God.? Even though they are seeing him face to face ? .The scriptures explain us that to see God, you need the right qualifications to see him. It may be argued that since Krsna was present on this earth and was visible to everyone, then why isn't He manifest to everyone now? But actually He was not manifest to everyone. When Krsna was present there were only a few people who could understand Him to be the Supreme Personality of Godhead. In the assembly of Kurus, when Sisupala spoke against Krsna being elected president of the assembly, Bhisma supported Him and proclaimed Him to be the Supreme God. Similarly, the Pandavas and a few others knew that He was the Supreme, but not everyone. He was not revealed to the nondevotees and the common man. Therefore in the Gita Krsna says that but for His pure devotees, all men consider Him to be like themselves. He was manifest only to His devotees as the reservoir of all pleasure. But to others, to unintelligent nondevotees, He was covered by His eternal potency. In the prayers of Kunti in the Srimad-Bhagavatam (1.8.18) it is said that the Lord is covered by the curtain of yoga-maya and thus ordinary people cannot understand Him. Kunti prays: "O my Lord, You are the maintainer of the entire universe, and devotional service to You is the highest religious principle. Therefore, I pray that You will also maintain me. Your transcendental form is covered by the yoga-maya. The brahmajyoti is the covering of the internal potency. May You kindly remove this glowing effulgence that impedes my seeing Your sac-cid-ananda-vigraha, Your eternal form of bliss and knowledge." Elsewhere in Bhagavad Gita, Lord Krishna explains that he is the light of Sun and Moon,the syllable Om in the Vedic Mantras, the taste of Water and the ability in man and sound in the ether. Who can deny that they have not seen the sunlight or moon light, drank a cup of water and felt the taste and so on. So, everyone is seeing God, albeit in varying degrees. "A monkey is fickle by nature. Then, he got drunk, consumes alcohol, gets stung by a scorpion, and a Ghost enters or possesses him, his fickleness reaches a level beyond imagination." Ok, to begin with , he is a monkey who is chanchala or fickle and then surapanam – alcohol to make him tipsy, Vrischika. a scorpion bite to make him real crazy and top of all possessed by a Ghost. I also heard that (not in this sloka) that he also steps on a burning coal. 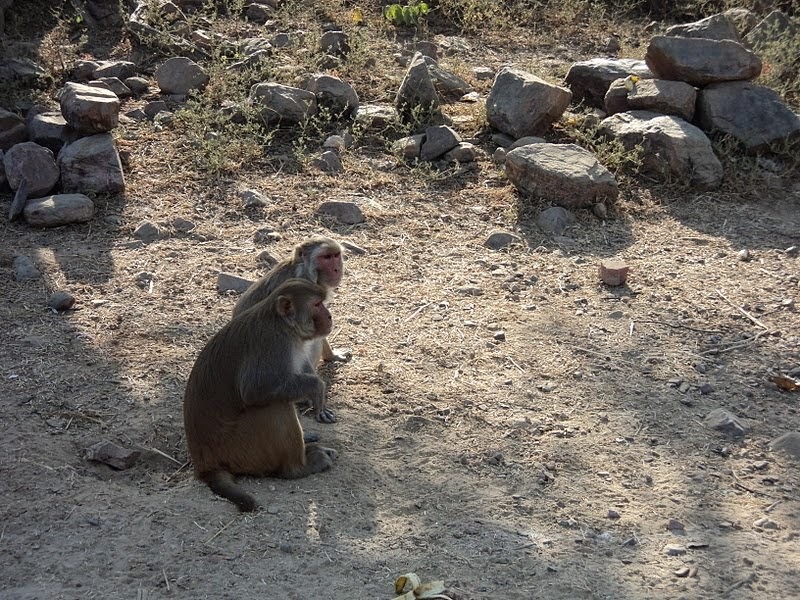 Imagine this..There was a Monkey.Immediately, my mind runs to vrindavan.The monkeys there are so notorious, they steal peoples spectacles, caps, bags what not for a ransom. So, when they steal something, they wont run away but, go to some high place like a tree or a wall and will be watching the owner.The only way to get the good back from this gentleman is to give him something like, couple of Bananas, piece of coconut or anything that arouses his interest.That's why, the first thing the tourists are advised by local people is to remove their spectacles.What if someone cant see without glasses.? Good luck... So, the negotiation starts..The monkey stilling on the top of a wall or tree and the person below showing her bunch of bananas.You show the gift, move a step forward, he move a step forward.Slowly, the negotiation process continues, step by step, until each other are within the arms distance of each other.Then, depending on how daring the person is, the person might simply exchange the good hand to hand or simply, throws the ransom near the monkey and the monkey throws the belongings of the person at them and snatches the prize.This is a perfect scenario. But, so many times people may loose both the ransom and their belongings, or they may get them in a broken or unusable condition because, after all a monkey might get bored and chew on to the plastic and fiber of the glasses etc. Anyway, this is the little background and glimpse of a monkeys way of life. For the mind is restless, turbulent, obstinate and very strong, O Krsna, and to subdue it is, it seems to me, more difficult than controlling the wind. one must engage one's mind fully in Krsna. Only then will there remain no other engagements to agitate the mind." And, in the next verse Lord Krishna acknowledges this fact and says, still it is possible to control the mind by suitable practice and detachment. sitting at your home, walking in a park. The ideal way is to chant in the morning before sunrise during the time called Brahma Muhurta,sometime between 4:00Am to 6:00 AM in the morning, because at that time of the day it is said that the mode of goodness prevails. What about alternative process of Yoga ? All glories to them, few years ago I used to practice Raja Yoga, Meditation, Pranayama and I did that for about 5 to 6 years and I realised that it was not for me, impractical, too hard and less results. Sovereign Hill is one of the most famous gold yielding mining of 1850s.Situated in the City of Ballarat and on Mount Pleasant, today it is a historic and cultural place.You step into Sovereign Hill and you will be transported back 150 years, Old Buildings, roads, Mine tunnels, gold refining factory etc. There are free and paid, guided mining tours.Carts being pulled by Horses. You can walk along the old, historic town at your pace, which is not a huge place and max should take about 2 to 3 hours. Then, there is Gold museum, where you can see the artefacts of famous gold nuggets found during the history of Sovereign Hill, various photographs of Europeans, the early settlers and also about the aboriginal people. There is an interesting movie about the Aboriginal people and culture that is shown,once in every 20 mins or so.Then, there is the Gold shop and various items of Gold etc.Anyway, I was told by one of my Gold savvy friend who like to buy gold coins informed me that the price of the gold coin is more costly in the shop then at the Gold Bullion here at Melbourne. Anyway, I am not so much into the gold stuff but, I did buy a $5 gold - a bottle that has some transparent liquid, may be distilled water and and some thinnest gold flakes. Looks good and as a Sovenier. The funny thing about this visit was that, I did not actually go to the Sovereign Hill or the Museum ( I was there 3 times before) because, I am on a different purpose attending a Spiritual Retreat at the Accommodation - Comfort Inn, which is right next to the Hill. We had fun in our own way, but managed to get some photos. Also, when I learnt that my son was going to visit this place again, as a part of his school exclusion, I did not bother much about visiting the hill. I read this amazing information from one of the visitor information boards up there which says “In 1853, they have recovered 14 Kg Gold Nuggets For every 30 cms mined and 1 ton gold for claim of bare 24 feet deep mine”. 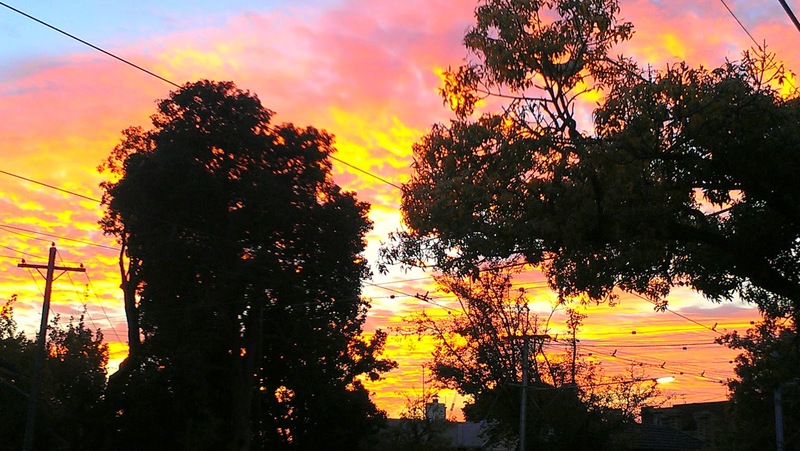 So, where is all that Gold gone? . Reminds me of a verse from Bhagavad Gita 16th Chapter Verse 21 and a story narrated by HH Mahavishnu Gosvami Maharaj in Sydney . So Narada muni said: “What is this, show me your bowl”. He showed the bowl, and it was just ordinary begging bowl. So the beggar went running to heavenly planets and he was very happy that now the bowl will be full. So eventually he reached there and found out Kuvera, you know. “Show me your bowl”, he showed his bowl. To his surprise, half the treasury was empty and even then the bowl was not full. So he was doubting, “whether there is a hole inside or what, I don’t know. It is not getting full.” So somehow or other he could not understand. So, then he started pouring again, within no time the whole treasury was empty and the bowl was not full. “Oh!” he said, “Narada, is silly man. He did not see whether he has bowl or not or whether it has hole inside”. So in the mean time Narada was passing though the heavenly planets. So he just showed the other way. And it was not a begging bowl, it was human skull. This human skull will never be satisfied even if the Kuvera’s treasury is poured into this. This is our greed. Please, we are all carrying that skull, and unlimited, insatiable desire is there. We have come to Australia, we have come here, we have gone to America, and all over the world we are earning very nice money, and even then running after… you know, this is greed. Please try to limit your things, try to think over these things. Human existence is slipping, away, and in order to protect our own interest, which is spiritual interest, we must draw somewhere the line of this kama, krodha and lobha. In a limited way, we are allowed to have, in a regulated way, but unregulated way, unlimitedly, if we run after these things then we are going to be destroyed completely. And these are kaam, krodha and lobha, Lust, Anger and Greed please leave them for good. And this is the clear instruction of Bhagavad-gita. And of the three, greed is the most horrible thing, because as we see from the above story, a person who is greedy can never be satisfied or be happy inspite of having the whole world. Holi is the festival of colors which was celebrated all over India, about 10 days ago.Anyway, here in Australia we are celebrating it on 26th of April at the Hare Krishna Vally (https://www.facebook.com/events/1376132762693869/). You can join me for this wonderful, fun filled event. Last year, it was a grand success and this year, more are expected. A little bit of background for this festival is that the name for Holi comes from Holika who was a demoness, sister of Hiranyakashipu.At the instigation of her brother, she wanted to kill Prahlad.She had a blanket which was imune to Fire.So, she wore that blanket and stepped into fire along with Prahlad.Lord Vishnu arranged that a mighty wind blowed away her blanket and she was burnt to death.To commemorate this event and the victory over evil, in the towns and villages of india, an effigy of Holika is burnt.Also, people take this oppertunity to get rid of all the unwanted stuff from their house and remove the clutter and rubbish into the fire called as,Holika Dahan (the burning away of Holika). What is more interesting is the Lath mar Holi. It is the Holi in which women folk hit men with sticks.It takes place days before the actual Holi in the neighbouring towns of Barsana and Nandgaon near Mathura in the state of Uttar Pradesh, where thousands of Hindus and tourists congregate, each year.The history and explanation of this strange custom and behaviour of the woman is that once during his earthly pastimes, Lord Krishna visited his beloved Radha's village on this day and playfully teased her and her friends. Taking offence at this, the women of Barsana chased him away. 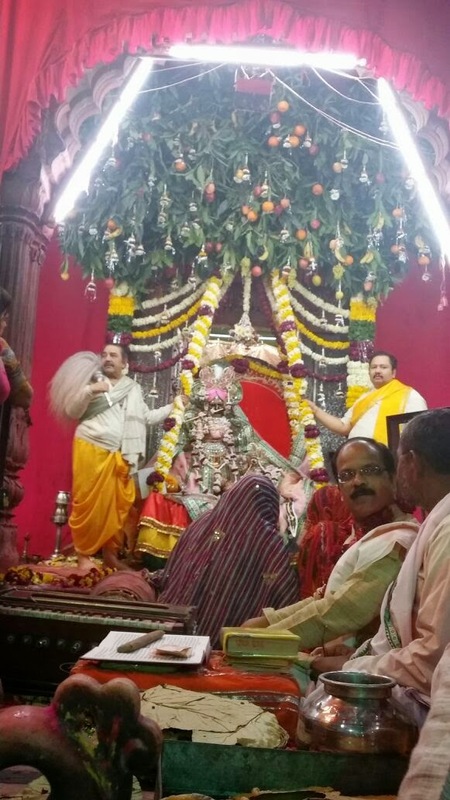 Since then, men from Krishna's village, Nandgaon, visit Barsana to play Holi in the town which has the distinction of having the famous temple called Shreeji's temple dedicated to Srimati RadhaRani. 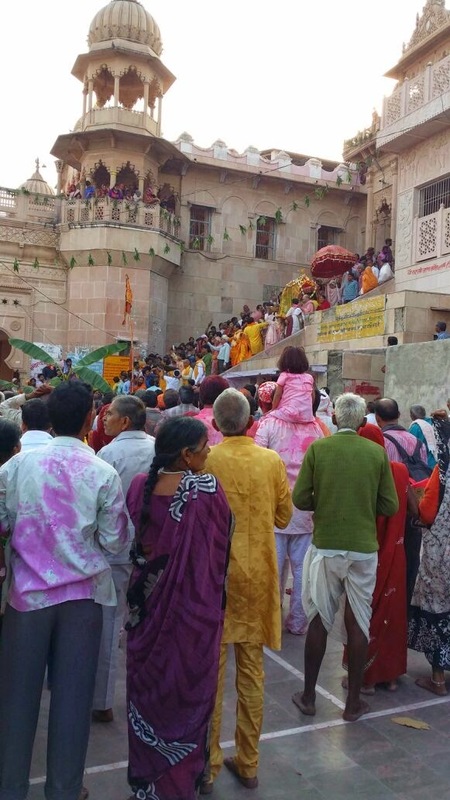 In the sprawling compound of the Radha Rani temple in Barsana, thousands gather to witness the Lath Mar holi when women beat up men with sticks as those on the sidelines become hysterical, sing Holi Songs and shout Sri Radhey or Sri Krishna. The Holi songs of Braj mandal are sung in pure Braj Bhasha. On the first day of Lath Mar Holi, gopas the Cowherd men from Nandgaon come to Barsana to play Holi with the gopis (Cow Girls) of Barsana. 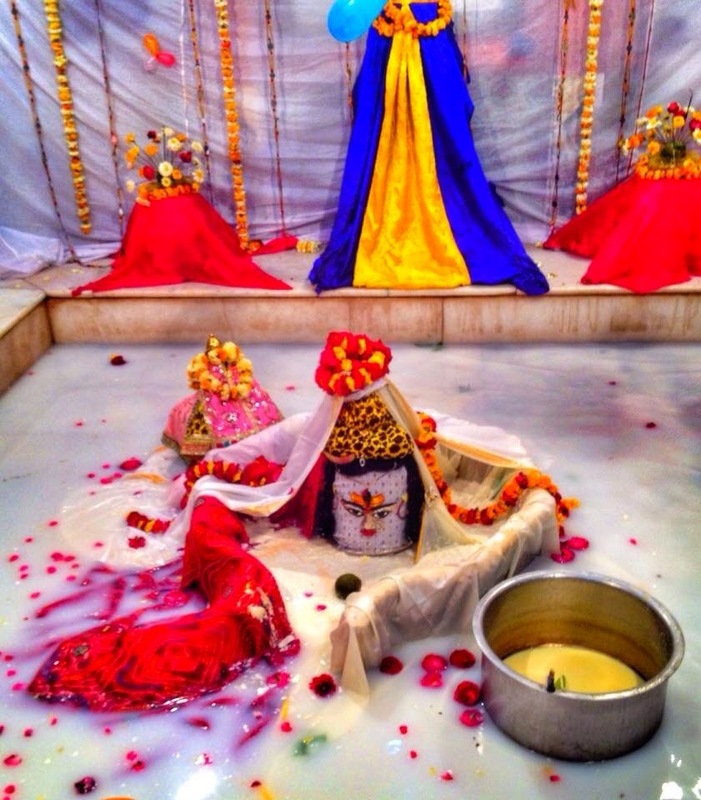 The festival begins with a ceremony at the Radha Rani temple. 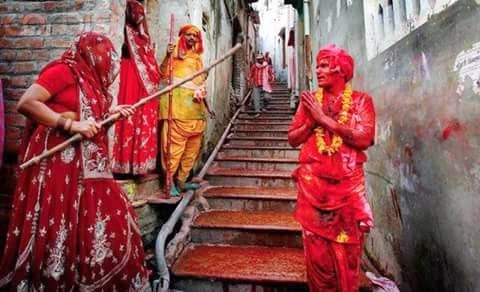 After this ceremony gopas then march out of the temple on the Rang Rangeeli Gali where they stop to play Holi with the gopis, who stand in groups along the street. The second day gopas from Barsana go to Nandgaon to play holi with gopis at Nandgaon. Mind you, it is not only a custom but a show of false anger, fun and entertainment. One of my good friend from Vrindavan, who actually visited Shreeji's temple on this occasion sent me these photographs that I am posting here. I hope to see some of you on 26th April at Hare Krishna Valley, Bambra, Victoria. “The Supreme Personality of Godhead is the cause of all causes, the original person from whom everything has emanated. He is the root cause of this cosmic manifestation, and the entire cosmos rests in Him, yet He is transcendental, for He does everything in relation to the material world through His external energy. He is eternally situated in the spiritual world — in Vaikuṇṭha or Goloka Vṛndavana — where He engages in His eternal pastimes. The material world is a product of His external energy, or material nature, which works under His direction. It is thus that creation, maintenance and annihilation take place. The Lord exists at all times. This is extremely difficult for a non-devotee to understand. Although the transcendental Supreme Personality of Godhead is perceivable by everyone, only the pure devotees perceive His presence and activities. The Supreme Personality of Godhead is completely free from material birth, death, old age and disease. Indeed, if anyone in this material world takes shelter of Him, he also becomes situated in that transcendental position. For the satisfaction of the devotee (paritrāṇāya sādhūnām), the Lord appears and exhibits His activities. His appearance, disappearance and other pastimes are not at all material. One who knows this secret can enter the kingdom of God. In the Lord, all opposing elements are adjusted. The Lord is situated in everyone’s heart. He is the controller of everything, He is the witness of all activities, and He is the original source of all living entities. Indeed, all living entities are parts of Him, for He is the origin of Mahā-Viṣṇu, who is the source of the living entities within this material world. The Lord can observe the activities of our senses, which can work and achieve material results because of His mercy. Although He is the original source of everything, He is untouched by any of His by-products. In this way He is like a gold mine, which is the source of gold in ornaments and yet is different from the ornaments themselves. The Lord is worshiped by the method prescribed in the Pañcarātras. He is the source of our knowledge, and He can give us liberation. Therefore it is our duty to understand Him according to the instructions of devotees, in particular the spiritual master. Although for us the mode of goodness is covered, by following the instructions of saintly persons and the spiritual master we can be freed from material clutches. 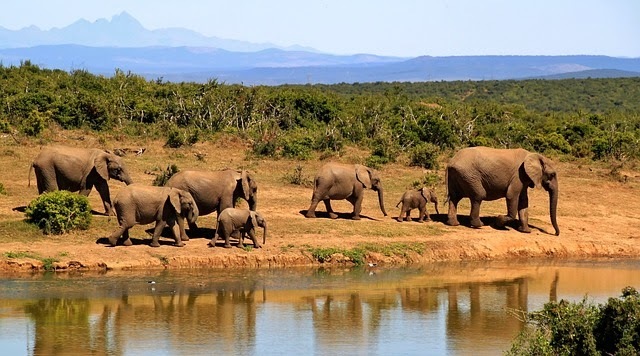 In this way the King of the elephants, Gajendra, offered prayers directly to the Supreme Personality of Godhead, without mistaking Him for one of the demigods. None of the demigods came to see him, not even Brahma or Shiva. Rather, the Supreme Personality of Godhead, Narayana, seated on Garuḍa, personally appeared before him. Gajendra, by lifting his trunk, offered obeisances to the Lord, and the Lord immediately pulled him from the water along with the crocodile who had captured his leg. Then the Lord killed the crocodile and thus rescued Gajendra. It was apparently just a coincidence that I picked up this book from the University library. I went there to pick-up some books on Project Management and I was walking past and noticed this book on, one of the shelves.This is a really interesting book that gave me insights into the world, life and culture of Aboriginal Australians.It was amazing to learn that Australia has been inhabited by Aboriginals since last 50 or 60 thousand years.I really like the way they lived, completely of the land.This is a civilization that thrived for so many years. It was interesting to know the customs and traditions of Aboriginal people.Also, it is saddening to see that within a span of 180 years, the whole civilization of Aboriginals is shattered. The intentions may be good. Like, the case of stolen generation, where the children are forcefully taken from their tribes, family's and grown in hostels managed by the church. 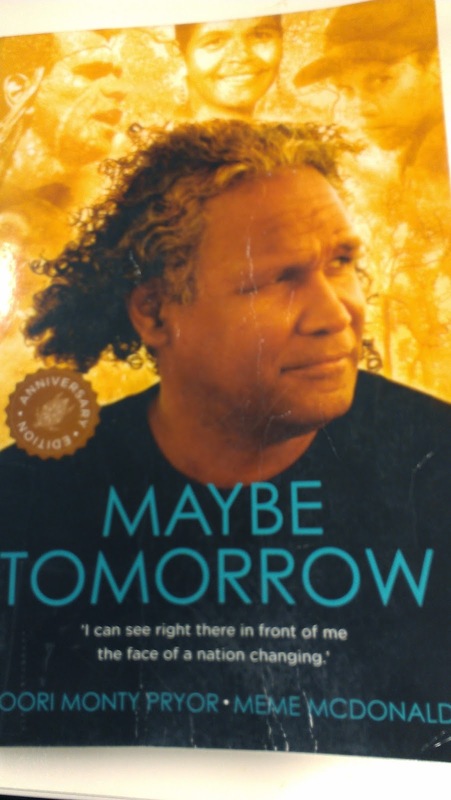 The intentions may be good but, the results are disastrous.As, Boori explains in the book, why do so many of the Aboriginals take up to drugs, Alcoholism, suicide is because they are taken off from the land, where they belong to and then from the families and then, the harsh treatments. Certainly, my views about the history and the aboriginals changed completely. I have so much respect for these people and their simple, culture. A culture, where young kids are taught to respect elders because, as Boori says in the book, in the wild if you don't listen to elders or follow their instructions, you will simply die and wont survive.One wrong move and a crocodile may kill you.And, also I think it is important for all the people living in Australia should know and learn about this oldest culture and through them learn the secrets of this wonderful land called Australia. In the words of Boori Monty Pryor "To feel happy about yourself, you must feel happy about the place you live in.To feel happy about the place you live in, you must get to know that place.To get to know that place, you must ask the people who lived there the longest, the Aboriginal people.We have the key that can open the door to the treasures of this land".I also appreciate the wonderful efforts of Boori in trying to bring awareness of his culture by visiting all the schools, for his optimistic view of life, for his positive outlook.Its so hard to imagine that one can go through so many difficulties in life and yet have so much faith in God, his ancestors and for a better future. I recommend everyone to read this wonderful book that gives so many insights into the world of Aboriginal culture.